I feel with the world in its current state, many of us experience fearfulness. But fear is the mind-killer. Fear paralyses us. Fear makes us smaller than we are. Fear tramples on our dreams. 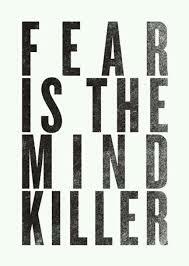 I am a huge fan of Frank Herbert’s Dune, from where the phrase, Fear is the mind-killer, originates. So, I was excited when I came across this blog post by the amazing Kristen Lamb, in which she quotes Frank Herbert, and talks about this topic much more eloquently than I ever could, so I’m sharing her post here. Even though Kristen is talking about fear from the point of view as a writer, I feel it affects us all and is therefore relevant to all of us. This article is exactly what i looking for, I have a blog where I post similar ideeas. Please, I would like to trlansate this article in romanian and then to post it on my personal blog, linking to your webpage as source. In our country not many knows read in english and I try to help at the school with some blogs about what I find online … Is this possible ? Thanks in advance. Hello Sandra, Sure. Feel free to translate the post in Romanian for your personal blog. I’m glad you liked it.